RJ Group is coming with new residential housing project RJ Cyber City which is located on Knowledge Park V, Greater Noida West. The Project is located at the most prime location of Greater Noida which gives you best connectivity to all the main hubs of National Capital Region. RJ Groups offers 1 BHK to 3 BHK apartments which different Floor sizes which are ranging from 525 Sq.ft to 2140 Sq.ft. The project is spread across in 20 acres of land and the township is designed by keeping in mind all the comforts of the modern citizen's life style. 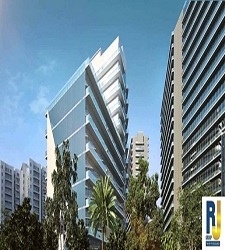 RJ group provides world class corporate offices, clubs, retail malls, gym and spa. RJ Cyber City Greater Noida West provides modern amenities like 3 tier security, garden, 24 hours power supply and covered parking. Project is connected with 130 metre wide road Noida Greater Noida Expressway and proposed Metro station. Established with a focus to serve and backed by passion and precision, RJ Group in its three decades of existence has grown to offer the full gamut of services. The company has left its lasting impressions over 3 million sq ft space across 40 projects. The projects owing to its strategic locations are the landmarks in the areas they are situated in, these project designs stand a silent testimony for underline comfort and stress-free living even today. The commercial constructions have evolved with the organizational growth to live up to their growing expectations with their cutting edge modern design employed then. Many an acclaimed hospitals and popular hospitality constructions bear their mark of quality. Another extensive expanse of 10 million sq. ft. in various pockets of South India carries the indelible imprint of its interior design, furnishing identities to internal spaces and complementing brand experience and personal lifestyles. The customization of each requirement, across every project, is deftly handled by a skilled professional team.